Viral infections occur when viruses enter cells in the body and begin reproducing, often causing illness. Viruses are tiny germs that can reproduce only by invading a living cell. 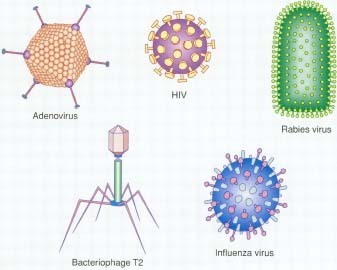 Viruses are far smaller than bacteria. They are so small that they could not be seen until the electron microscope was invented in the 1940s. Unlike most bacteria, viruses are not complete cells that can function on their own. They cannot convert carbohydrates to energy, the way that bacteria and other living cells do. Viruses depend on other organisms for energy. And viruses cannot reproduce unless they get inside a living cell. Most viruses consist only of tiny particles of nucleic acid (the material that makes up genes) surrounded by a coat of protein. Some have an outer envelope as well. There are thousands of viruses, and in humans they cause a wide range of diseases. For instance, rhinoviruses cause colds, influenza viruses cause flu, adenoviruses cause various respiratory problems, and rotaviruses cause gastroenteritis. Polioviruses can make their way to the spinal cord and cause paralysis, while coxsackieviruses (sometimes written as Coxsackie viruses) and echoviruses sometimes infect the heart or the membranes surrounding the spinal cord or lungs. Herpesviruses cause cold sores, chickenpox, and genital herpes, a sexually transmitted disease. Other viruses cause a variety of conditions from measles and mumps to AIDS. Most viruses do not cause serious diseases and are killed by the body's immune system—its network of natural defenses. In many cases, people never even know they have been infected. But unlike bacteria, which can be killed by antibiotics, most viruses are not affected by existing medicines. Fortunately, scientists have been able to make vaccines, which help the body develop natural defenses to prevent many viral infections. How Do Viruses Infect the Body? Viruses can enter the human body through any of its openings, but most often they use the nose and mouth. Once inside, the virus attaches itself to the outside of the kind of cell it attacks, called a host cell. For example, a rhinovirus attacks cells in the nose, while an enterovirus binds to cells in the stomach and intestines. Then the virus works its way through the host cell's outer membrane. After entering the cell, the virus begins making identical viruses from the host cell's protein. These new viruses may make their way back out through the host cell's membrane, sometimes destroying the cell, and then attacking new host cells. This process continues until the body develops enough antibodies * and other defenses to defeat the viral invaders. It would seem to be a simple matter to tell if something is alive. But biologists disagree on whether viruses are a form of life. Viruses lack certain features that other forms of life have. They cannot convert carbohydrates, proteins, or fats into energy, a process called metabolism. They cannot reproduce on their own, but must enter a living cell and use the host cell's energy. On the other hand, like all life forms, viruses do have genes made of nucleic acid that contain the information they need to reproduce. Biologists have an elaborate way of classifying every form of life. Each is grouped into a kingdom (such as the Animal Kingdom) and smaller sub-categories called the phylum, class, genus, and species. Bacteria and fungi each have a kingdom of their own, but viruses are left out of this system. Many biologists think that, unlike the forms of life grouped into kingdoms, viruses did not evolve (develop) as a group. Instead, viruses may have developed individually from the kind of cells they now infect—animal cells, plant cells, or bacteria. * antibodies are proteins made by the body's immune system to target a specific kind of germ or other foreign substance. Not all viruses attack only one part of the body, causing what is called a localized infection. Some viruses spread through the blood-stream or the nerves, attacking cells throughout the body. For instance, HIV, the human immunodeficiency virus that causes AIDS, attacks certain cells of the immune system that are located throughout the body. How Do Viruses Cause Illness? Viruses can cause illness by destroying or interfering with the functioning of large numbers of important cells. Sometimes, as mentioned earlier, the cell is destroyed when the newly created viruses leave it. Sometimes the virus keeps the cell from producing the energy it needs to live, or the virus upsets the cell's chemical balance in some other way. Sometimes the virus seems to trigger a mysterious process called "programmed cell death" or apoptosis (ap-op-TO-sis) that kills the cell. Some persistent or latent viral infections seem to transform cells into a cancerous state that makes them grow out of control. It has been estimated that 10 to 20 percent of cancers are caused by viral infections. The most common are liver cancer caused by persistent infection with Hepatitis B or Hepatitis C virus, and cancer of the cervix (the bottom of a woman's uterus or womb), linked to certain strains of the human papillomavirus. * latent infections are dormant or hidden illnesses that do not show the signs and symptoms of active diseases. There are thousands of kinds of viruses. Most consist only of tiny particles of genetic material surrounded by a coat of protein and sometimes an outer envelope. Specific viruses attach themselves to the outsides of specific host cells, and then work their way inside through the host's outer membranes. Once inside their host cells, the viruses reproduce. The new viruses can destroy their host cells and then move on to attack new host cells. killed are very important to the body's functioning, like those in the lungs or central nervous system, or if the cells cannot reproduce quickly enough to replace the ones being destroyed. An individual adenovirus viewed under an electron microscope. Viruses are so small that they could not be seen until the electron microscope was invented in the 1940s. This one was photographed at 800,000 times its original size. How Are Viral Infections Diagnosed and Treated? Symptoms vary widely, depending on the virus and the organs involved. Many viruses, like many bacteria, cause fever, and either respiratory symptoms (coughing and sneezing) or intestinal symptoms (nausea, vomiting, diarrhea). Viral illnesses often cause high fevers in young children, even when the illnesses are not dangerous. Some viral infections, such as influenza, the common cold, and chickenpox, are easily recognized by their symptoms and no lab tests are needed. For many others, such as viral hepatitis, AIDS, and mononucleosis, a blood sample is analyzed for the presence of specific antibodies to the virus. If present, these antibodies help confirm the diagnosis. 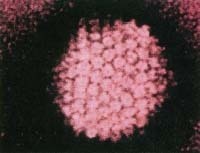 In some cases, a virus may be grown in the laboratory, using a technique called tissue culture, or identified by its nucleic acid, using a technique called polymerase chain reaction (PCR). Tests like PCR or tissue culture are used when antibody tests are not precise enough or when the actual amount of a virus in the body must be determined. How Are Viral Infections Prevented? The first step in preventing the spread of viral infections is simply to practice good hygiene. This means washing the hands often, and eating only food that has been prepared properly. It also means building and maintaining facilities for getting rid of sewage safely and for providing clean drinking water. Another important preventive measure is immunizing people against viruses. This involves giving people vaccines that stimulate the immune system to make antibodies, proteins that target a specific germ. Vaccines to prevent Hepatitis B, polio, mumps, measles, rubella (German measles), and chickenpox are usually given to babies and young children in the United States. Vaccines also can prevent influenza and Hepatitis A. When people have a mild illness—perhaps fever and an upset stomach, perhaps nausea and diarrhea—they often say they have a "24-hour virus" or a "stomach virus." Many viruses can cause these kinds of symptoms, but there are many other possible causes as well, including bacterial infection or bacterial food poisoning. People usually recover from these brief or mild illnesses before doctors can do the tests that determine the causes. So a "stomach virus" may or may not be a virus at all. Vaccines are useful only against certain kinds of viruses. For example, the polioviruses that cause poliomyelitis (polio), a great crippler of children in the past, are few in number and relatively stable. So it was possible in the 1950s to make a vaccine that protects children from getting polio (although the illness still occurs in the developing world where fewer children are vaccinated). On the other hand, influenza viruses change in minor ways every few years and in a major way about every ten years, so a flu vaccine is useful for only a year or two. One reason a vaccine for the common cold has never been developed is that there are at least a hundred different rhinoviruses that cause colds, and so far it has not been possible to make a vaccine that works against all of them. A similar problem with HIV, which has many different and fast-changing strains (variations), is one of several reasons why progress toward an AIDS vaccine has been slow.